Team Phoenix takes on the Gauntlet! If you've played at any of our recent events and seen a big metal gauntlet being worn by some of the staff...there's a reason for that! Last year a team of judges went forth as team Except, All Substitutions and conquered Mox Boarding House's charity board game tournament, the Gauntlet. This year they're back as Team Phoenix trying for a repeat performance and we could use your support to help them succeed! For the past 5 years Mox Boarding House has thrown a board gaming tournament to benefit various local charities that work to make the Pudget Sound a better place to live in. This year the chosen charity is Wellspring Family Services, a local non-profit that provides community services and counseling for families in need. They're also in the middle of a shoe drive, which is where the Gauntlet comes in. Every donation you make helps them get a pair of shoes for a child facing homelessness. Last year the Gauntlet tournament raised over $138,000 to benefit Treehouse, a Seattle based group that supports foster children and their families. This year on May 20th, they aim to beat that number! And you can help! We've got a bunch of cool gifts available depending on how much you choose to donate. Check them out! $15 Donation - Play Mats! One of the things that makes Team Phoenix stand out is that all of our members are judges for Magic the Gathering. All judges wind up with a ton of play mats exclusive to judges. Joe and Emily have donated a bunch of play mats with designs ranging from interesting to rare. One of these at random can be yours for the low low donation of $15 to the cause! Keet, our wonderful graphic designer has come up with a t-shirt design that you can only get through this event! Sizes range from small to 3XL, but quantities of each are limited. Donate soon to make sure we still have the size in stock that you want! $30 Donation - Dominaria Sealed Charity Tournament! Prizes: We'll be offering prizes of a pack per win. Players that go undefeated will receive a t-shirt in addition to their packs, and for every 8 players that enter the event we will randomly select one player at the end of the event to receive a prerelease kit from any set from the last 2 years worth of Magic (Dominaria, Ixalan, Hour of Devastation, Amonkhet, Kaladesh and Aether Revolt). $300 - Dinner with the Team! Wanna play board games with the gauntlet champions? Well now you know how! A mere $300 buys you an evening of dinner and games with Team Phoenix. Simply click on the gauntlet below or head to http://phoenixseattle.com/Gauntlet/ to be directed to our donation page! Q: What if I want multiple tiers of reward? A: Donate the appropriate amount for each level of reward and we'll give you both! For example, $40 gets you both a play mat and a t-shirt. Q: How can I pick up my rewards? 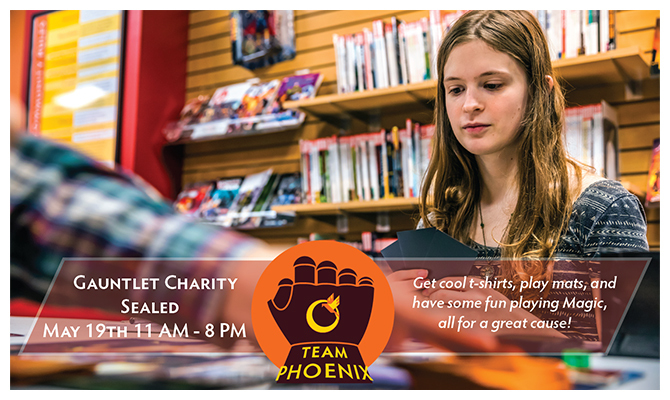 A: If you're local, you can drop by Phoenix to pick up play mats and t-shirts. Just give us about 24 hours to make sure we've processed your donation. If you're not local, our team will find a way to get you the shirts and play mats either by mail or some other method! Just make sure to leave your name and contact information so that we can get in touch with you to figure our rewards. 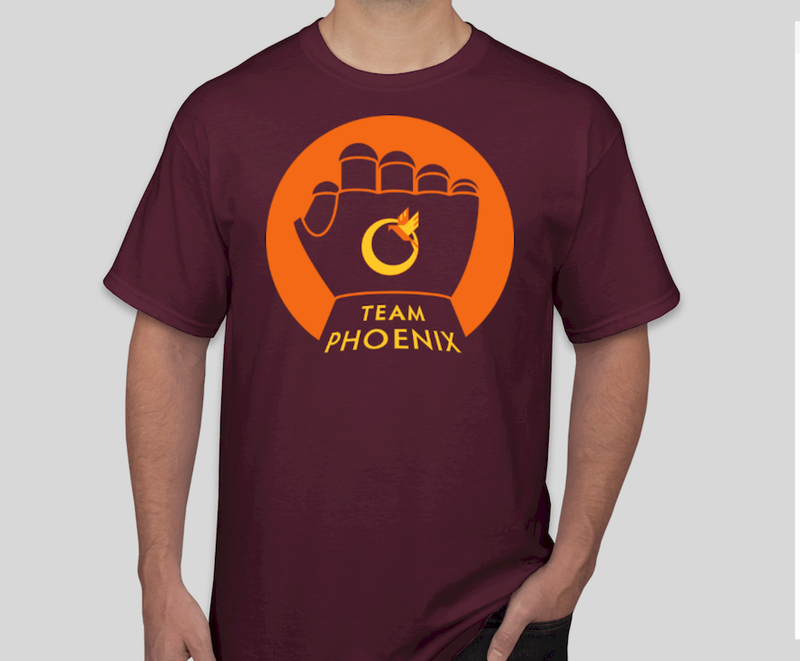 Q: How does donating help Team Phoenix? A: Each team earns power ups during the tournament based on the amount of money raised. You can watch how our team uses those power ups by going to the Card Kingdom Twitch channel! They're also going to be showing the entirety of the tournament there too!